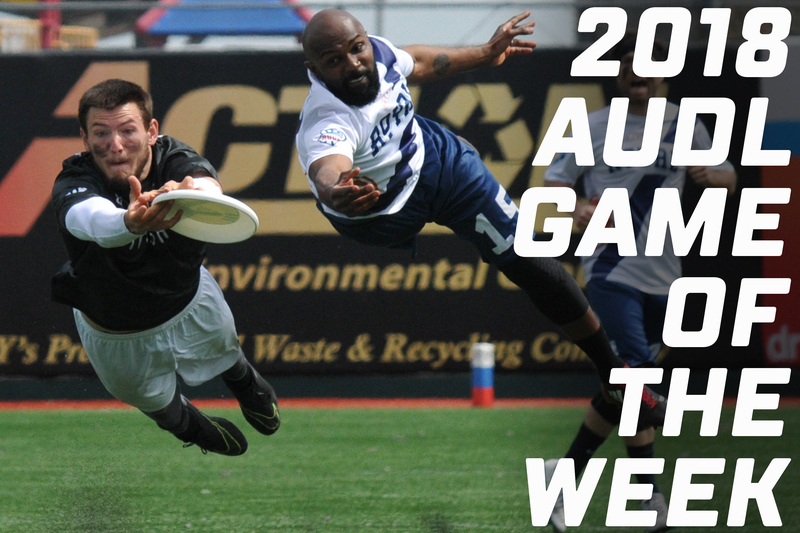 With less than two weeks until the start of the 2018 AUDL season, it's time to let the hype blossom into full blown excitement. The following is a breakdown of the 16 Game of the Week matchups that will air on Stadium this year. There's a terrific balance between traditional rivalries like Toronto-DC, burgeoning grudges like Tampa Bay-Dallas, and never-before-seen matchups like Austin-Los Angeles. All times are listed in Eastern. The very first showcase of the 2018 season might be its best. Former Cannons superstar Mischa Freystaetter is set to make his debut with the Flyers, while Tampa Bay and their arsenal of talented throwers led by Bobby Ley and Cole Sullivan are eager to prove themselves in the absence of Freystaetter's prolific production. Raleigh is the odds on favorite to win it all this year, and their combination of talent and depth may be the best of any team the AUDL has ever seen. A perennial shootout between two teams who love to make big plays, this year's version feels more personal than ever. There's never a dull moment in the Flyers and Cannons rivalry. DC has traditionally won out in this East Division matchup, and were the victors in their last encounter with Montreal in the opening round of the 2017 playoffs. But with increased chemistry among their foreign imports and an array of downfield playmakers, the Royal enter 2018 with perhaps the offensive potential in their division. The French connection of Quentin Bonnaud and Stève Bonneau were hard to slow down last year and have had a season to grow. But the fourth-ranked Breeze defense led by Delrico Johnson will present a stout challenge for Montreal's playoff ambitions. One of the more intriguing matchups in this season's slate of interdivisional games, the Aviators will travel to face the Sol in a first-ever meeting between two offensively minded franchises. What Los Angeles may lack in size against Austin they will make up for in speed and disc skills, as 2016 All-AUDL member Mark Elbogen looks to make a big return after an injury sidelined him for a majority of the 2017 season. Both teams are approaching 2018 with a lot of optimism, making this game an early season test for each team's ability to manage and meet expectations. A rematch of the thrilling 2017 AUDL title game, any Toronto and San Francisco matchup is sure to feature a wonderful contrast of East versus West styles. The Rush won their first matchup last season thanks to Andrew Carroll's 8-assist, 6-goal showstopper of a game that included a little bit of everything offensively. But the FlameThrowers prevailed when it mattered most, claiming the championship trophy behind a vintage Joye-to-Kittredge performance. Now with a revamped roster, San Francisco seeks to defend its throne against a Toronto squad hungry for revenge. Game highlights from the 2017 AUDL championship game between Toronto and San Francisco. Raleigh finished the 2017 regular season with the best record in the league, but could not get past Dallas and their relentless athleticism in the South Division championship game in the playoffs. The Flyers have once again reloaded with more talent than ever before, but the Roughnecks remain unconvinced that they are beneath anyone in the South. Jacob Fairfax was a reliable target against Dallas season, hauling in 10 goals in three games. Jay Froude was even better, racking up 15 goals for the Roughnecks as they took the season series 2-1. Expect this game to feel like a championship bout in terms of skill, execution, and emotion as this game will likely have large ramifications on the playoffs. The Spiders were the upstart team in the league the first two months of the season in 2017, and are looking to replicate their scorching start with one of the most consistent offenses in the AUDL led by 2017 All-AUDL member Justin Norden. Los Angeles owned this rivalry last year, however, taking the season series 3-1 by scoring nearly 27 goals per game in their matchups, including a 33-24 drubbing in the first round of the playoffs. If San Jose wants to return to the postseason in 2018, beating LA will be a necessary point along the path. The Breeze held the lead for the majority of their game against the Flyers last season before a late-game, Nethercutt-fueled Raleigh comeback thwarted DC's potential for a big upset on the road. The wrinkle to this game is that DC was the only team in the league in 2017 to go undefeated at home, and will now play host to a Flyers team that may be looking slightly past the Breeze. DC handler Lloyd Blake did a great job of using his large frame and precise throws to dictate the Breeze's steady offensive drives in last season's matchup. But the Breeze will need to come up with a way to stop Raleigh's seamless offensive attack, which completed a staggering 336 throws at a 94 percent clip against DC. The last matchup between the Breeze and Flyers came down to a half field hammer throw at the end of regulation. After missing the playoffs in each of the past two seasons, the Wildfire have some serious upside going into 2018. Despite winning just three games last season, Chicago was competitive in most of their matchups thanks to the dynamic offensive duo of MVP finalist Pawel Janas and Michael Pardo, losing five games by three goals or fewer, including two times to Madison. And now Chicago has added two-time AUDL champion Kurt Gibson and former Madison standout Ross Barker. The Radicals haven't lost to their divisional rivals since 2014, and know how important home field advantage is for the playoffs, especially with this season's Championship Weekend being held in Madison. A rematch of the 2015 semifinal, the Flyers vertical attack will once again try to breech Madison's staunch zone defensive schemes, but this time in the raucous confines of Breese Stevens Field. The Radicals prevailed in the last meeting, but this Raleigh team has considerably more firepower and playmaking talent at the skill positions. Sometimes Madison's offense can stall in big games, which is why Kevin Brown's powerful throws will be needed against a formidable opponent like the Flyers. This could be a preview of the 2018 championship game. Don't sleep on the AlleyCats. Though Indy is four years removed from their last playoff appearance, they roster some of the best young talent in the league, and they are looking to make a statement in primetime against a familiar opponent. Similarly, the Wind Chill have found rising success in recent years thanks to their developing contingent of playmakers, led by the cutting tandem of Ryan Osgar and Greg Cousins, and bolstered by the throws of Josh Klane. With Minnesota's sights set on their first final four appearance as a franchise, Indianapolis can not only play spoiler, but re-establish themselves as a power in the Midwest. The Indianapolis versus Minnesota rivalry often comes down to the final possession. An East Division rivalry that has taken on a renewed vigor the past two seasons, the Breeze will likely once again look to displace Toronto from their perch atop the standings. DC is the only franchise in the AUDL to notch more than one win against Toronto. DC claimed both games at home during last season's series, but the Rush vanquished the Breeze from the playoffs for the third time in four seasons. Both teams boast a lot of young talent, but the group of players that are stepping into larger roles for the Rush are becoming something special. Highlights from the last matchup between the Breeze and Rush during the 2017 AUDL playoffs. Montreal eliminated New York from the playoffs in Week 14 of 2017, ending a four-year postseason streak for the Empire and effectively taking perenially held their spot. The Royal are looking for similar results this year, but will have to contend with an Empire roster that added the lanky playmaking of Marques Brownlee and four-time AUDL champion Beau Kittredge. The Nasser Mbae Vogel vs Jeff Babbitt is one of the most engaging 1-v-1 matchups in the league, and by this point in the season both teams will be desperate to clinch their postseason positions. Foothill College has been home to some amazing AUDL matchups, and this late season West Division tilt with major playoff implications is setting up to be a classic. Both teams thrive on fast paced offense and opportunistic defensive pressure, making for a great showcase in primetime. They also both feature a host of underrated playmakers: Eric Lissner of the Aviators doesn't get enough credit for his consistency on offense; Brandon Fein is coming off a career year in which he got 24 blocks - good for ninth in the AUDL - on the Spiders defense. Eric Lissner has averaged 38 assists and 20 goals per season in three years with the Aviators. Madison has never lost to the AlleyCats in six seasons of play, but that doesn't preclude this from being one of the most perennially nailbiting matchups in the AUDL. Indy has continually taken the Radicals to the brink in Madison, completing spectacular buzzer beaters only to fall just short at the end. But with the AlleyCats' newfound mojo and the Radicals' mounting expectations for nothing less than a title, this game has all the makings for a historic barnburner. The first team to ever hand the Roughnecks not just one loss but two, the Cannons match up as well as anyone against Dallas thanks to their swagger and throwing attack. Jordan Huston (18 goals in three games in '17) deserves a lot of credit for finding space to operate against very good Roughnecks defenders, but the lion's share of credit for the Cannons' successes against Dallas goes to the Tampa Bay handler lines led by Bobby Ley and Cole Sullivan. The Roughnecks did get the last laugh of 2017, dismissing the Cannons 22-12 in the opening round of the playoffs thanks to stifling defensive play. A rivalry whose games end in overtime more times than not, what better way to finish the 2018 AUDL regular season than an Empire vs Breeze matchup? For all of the analysis of DC's patient offense vs New York's formidable defense, these games usually come down to intangibles and simply which players step up in big moments. Lloyd Blake was the hero in their last meeting, running down a disc in the open field before the Breeze punched in the sudden death, double overtime game winner at home.